The dense blanket of fog covering Casco Bay slowly dissipated, revealing the majestic 18-deck “Anthem of the Seas” cruise ship, towering far above the group of people eagerly waiting below to explore all it had to offer. Once on board, the group’s first stop on the tour took place in the ship’s expansive Broadway-style theater, where the audience heard from representatives from the University of Southern Maine’s Tourism and Hospitality program, AAA Northern New England, and Royal Caribbean International as they shared the latest collaborative effort to provide USM’s students with real-time internship experiences in the industry. The tour and a luncheon, held aboard the impressive Royal Caribbean cruise ship was the third such event held since 2014, when USM and AAA began their partnership, then with Holland America and their ship, the MS Veendam. More than 100 AAA members, along with USM faculty and staff enjoyed this year’s sold-out event, which raised $6,000 towards scholarships to help students fund their participation in the internship’s culminating cruise. This semester marks the first time USM and AAA have worked together with Royal Caribbean. Among the company’s many staff members who graciously hosted the group during extensive tours and the luncheon in the ship’s restaurant “Chic,” were Melissa Ozkurt ’91, USM alumna and Royal Caribbean’s business development manager. She presented information about the ship and the cruise, and noted how thrilled she was to see her alma mater create such an exciting program offering its students real, behind-the-scenes exposure to her industry. Tracy Michaud, professor and chair of Tourism and Hospitality, discussed the importance of this program to not only USM’s students, but also the local tourism industry. Portland (and Maine), are becoming ever more important as ports of call for the cruise ships. Portland was listed as one of the top five favorite ports from Royal Caribbean’s passengers. In 2017 it’s anticipated that by the end of the season cruise lines will send more than 125,000 visitors per year to the city, and more than 380,000 state-wide. Andrew Leighton ’16, is one of the interns who has ended up working for AAA – he started his new job just this past January. He was on board to help with the luncheon event, and presented information to the crowd about the internship, and shared his experience having done the cruise himself as an intern in 2016 on the Veendam. 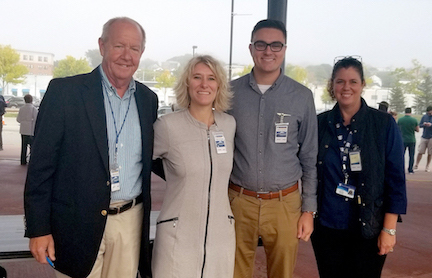 As a part of the cruise capstone, several paid interns are hired by AAANorthern New England to create and manage special cultural events for the AAA passengers on board the cruise. In 2016, the students who went on the cruise not only hostedthe special event (which was a Bermuda “Foodie Tour” with Chef Jaelen Steede), they managed a media campaign, researched the Bermuda cruise tourist market and explored the island as travelers themselves, all while learning about the local culture. Not only will USM’s Tourism students have the opportunity to pursue an internship with AAA, culminating in the cruise in May 2018 with Royal Caribbean to Bermuda, but other students, as well as the general public can also join the cruise. The cruise takes place from May 26-31, and can be booked through AAA. In addition, new for this year, will be an opportunity in January 2018 to take a cruise to Cuba. 4900 passengers and 1400 crew. Among other amenities the touring group was introduced to, were three theaters (one being so high tech, it cost as much to build as the very first Royal Caribbean cruise ship), several pools, a sports court area that can be set up for basketball, a roller rink, or even bumper cars, a full luxury spa, many shops, a casino, and multiple restaurants offering a wide variety of dining, including one from renowned chef Jamie Oliver. 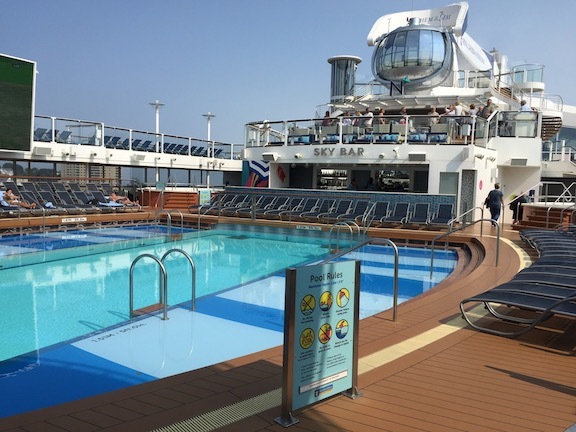 The ship also offers unique experiences from a robotic bartender, to a wave pool where passengers can surf, a skydiving simulator and the “North Star” observation tower – where people can enter a glass-walled capsule that raises up far above the ship for a 360 degree, eagle eye view. Tracy Michaud, Tourism and Hospitality professor and chair, said the MS Veendam experience was terrific for USM’s students, but the sheer magnitude of the Royal Caribbean Quantum Class ship, will offer them a much broader experience both as a passenger and behind the scenes. USM’s Tourism and Hospitality program currently offers a Bachelor of Arts in tourism and hospitality, featuring a broad array of courses, specialized concentrations in key skills areas and popular subjects, and faculty whose expertise touches on many aspects of tourism and hospitality. Professional experiences, including internships and practicums, provide critical, real-world experience for students in various aspects of tourism.